This extensive book bestows readers with full expositions of the thought of the leading modern theologians and philosophers of religion since the eighteenth century Enlightenment. "Modern Christian Thought" provides the reader with ample, lucid, and scholarly summaries of the ideas of the leading theologians and religious thinkers in the Christian tradition of the past 300 years. Gives the reader scholarly, up-to-date expositions and criticisms of the major thinkers in the Christian tradition since the eighteenth century and their importance for religious thought. Provides readers with background information on movements such as the Enlightenment, Romanticism, Idealism, Darwinism, Existentialism, and Liberation Theology. Covers thinkers such as David Hume, Immanuel Kant, J.J. Rousseau, Kierkegaard, Nietzsche, J.G. Hamann, J.G. Herder, Louis Bautain, Maurice Blondel, Wilhelm Herrman, and many others. Appropriate for readers interested in Modern and Contemporary Christian Thought and Theology as well as Twentieth-Century Religious Thought. 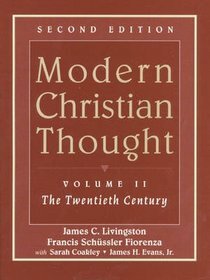 About "Modern Christian Thought (Vol 2)"
Elisabeth Schussler Fiorenza (Dr. Theol., University of Munster) is Krister Stendalh Professor of Scripture and Interpretation at Harvard Divinity School, she has done pioneering work in biblical interpretation and feminist theology. Some of her many books include Democratizing Biblical Studies: Toward an emancipatory educational Space; In Memory of Her (translated into 14 languages); Revelation: Vision of a Just World; Introducing Feminist Biblical Interpretation and The Power of the Word: Scripture and the Rhetoric of Empire. Modernism. 15. Kierkegaard And Nietzsche: Toward The Twentieth Century.